Transit artifacts can glimmer like icons (the token, a lit station globe) or provoke a sense of mystery and whimsy with their antiquated purpose (a Bend-o? a scleroscope?). Join our archives and collections staff as we bring objects and photographs from the Museum’s collection to life through writing, storytelling, and imaginative interpretation. 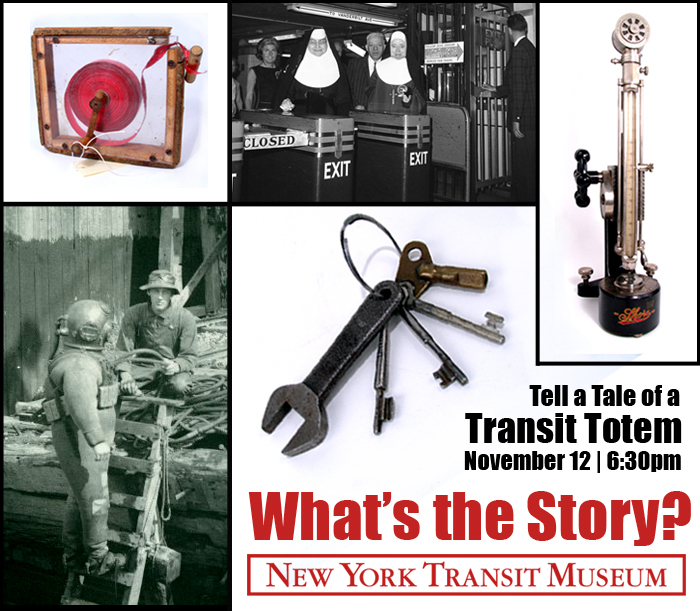 A sampling of artifacts and images are available online now – join us Wednesday, November 12th at 6:30pm to see these and many more in a pop-up exhibit designed to inspire your writing. Create an exhibit label, poem, or short story; try your hand at the nuanced craft of lexicography; or show off your expertise by schooling us all in the true provenance of an object. Fill the evening with a mixture of truth and fiction; we’re on the hunt for both the crafty and the credible! Submit your pieces in advance or join us for a writing session and open mic on November 12th.